It's Friday, which means it's soon weekend - enjoy! At the moment there is an Otto Dix exhibition in town, so I am going to see it tomorrow . Love your album Val, very pretty, I think I recognise that blouse! Great recycling! And of course there is a lot of red in our home town! Wonderful post, Valerie, from the beautiful header to the end. 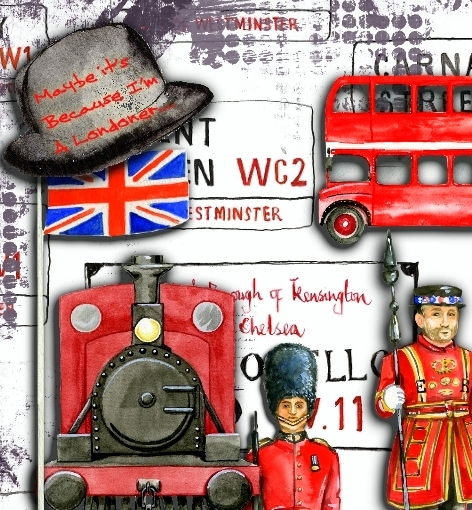 Your red page for the 50 shades of red event is fabulous and has all those red items I think of when I remember London. Your album is unique and so creative. Wow,ein tolles jornal hast Du da genäht,eine großartige idee,hast du das aus den kopf genäht,oder gibt es eine anleitung dafür?? ich würde das gern auch mal probiren,dann wären meine bücher nicht mehr so nackgig. deine rote londion seite ist klasse geworden. die kunstbilder sind ja auch genial,so hat jeder seinen eignen stil. hier ist das wetter auch gut,es ist nicht mehr so kalt. Lovely new journal, I really like the pocket idea on the front. Your hybird page is gorgeous, I would like to visit London one day.....it's on my "bucket" list. I thoroughly enjoyed the Mother Ey information and all the art about her. She was something wasn't she? I LOVE your new header........seems like I've been off the PC for ages instead of a week........so much going on right now.....I guess it is just "life". Wonderful idea to change the blouse into something you will love to use. The pocket will be so useful. 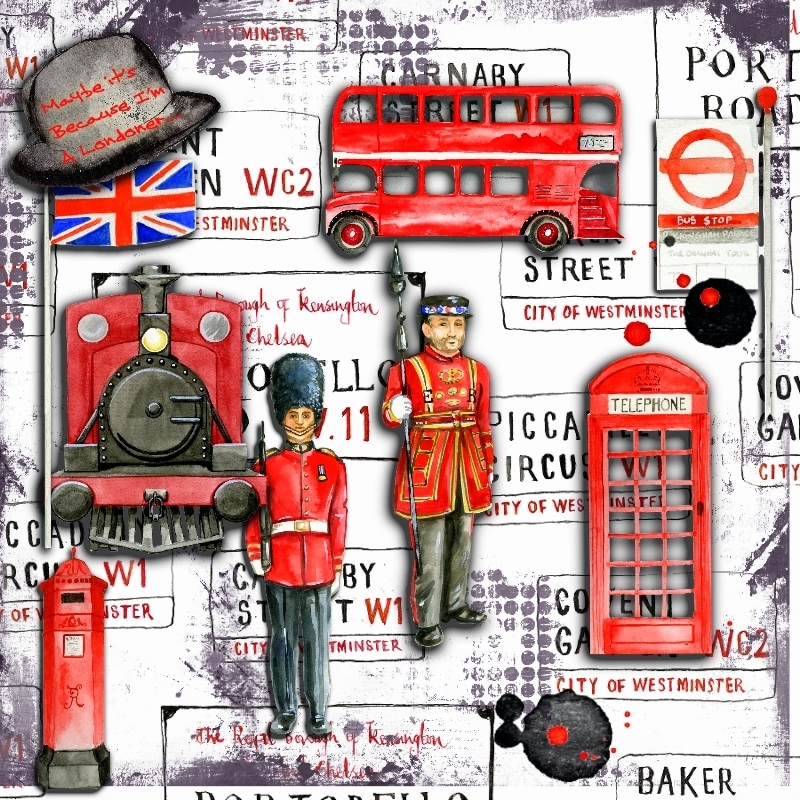 Wonderful page with your beloved London and the beautiful bright reds that you have chosen to represent it all. Great story about Mother Ey and her interesting lifestyle. Wonderful artwork in your photographs as well. Lovely journal and a beautiful digi piece for Linda's theme - what is much appreciated. Fantastic art in the museum there! Thanks for this most interesting tour. Lovely work for the challenges as well, great idea to recycle that blouse. I love your London collage. It shows all the red things from the city! I am just 2 hours away by train but I haven't visited for years. You collage made me feel like taking a trip....especially to visit the galleries! I love your recycled journal! How very clever to use the pocket to hold utensils. Lovely art and intriguing exhibit as well. Love your London page Valerie - I've never thought of London as being so red - but it is - this was the perfect challenge and page to show that too. Fabulous art in that museum - thanks for sharing your great photo and interesting info. Ooops nearly forgot to mention the fabulous album you created with your blouse - what a brilliant recycling project. Wow, loved you post ... especially the London collage. Enjoy seeing the exhibition in town, tomorrow. Your fabric is really cute! And clever too -- my colors! 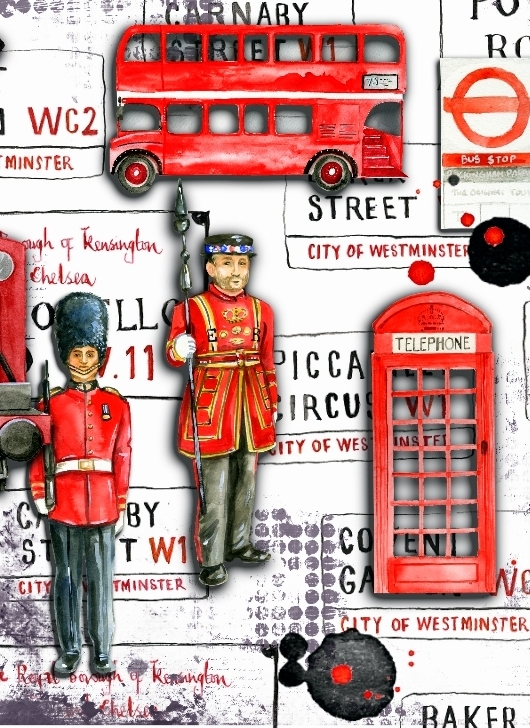 And of course I love all things London, all things Brit so you had me with a big smile with your collage! Definitely a keeper! thank you for sharing so many wonderful things in the museum-along with a bit of history too. Your fabric journal is wonderful, and oh how I LOVE your London Red page-fantastic! Happy PPF! Love how you recycled the blouse, it is a fabulous cover for the pages. The page for London looks awesome, fabulous images. Super photos of the paintings in the gallery. Lustig dein Journal im Schlafanzug, klasse Idee. Deine roten London-Impressionen gefallen mir auch sehr gut. Na und die Bildersammlung dieser netten Dame ist schon superklasse, da wäre manches Museum froh diese Exponate zu besitzen. Tolle Fotos hast du gemacht um uns genüßlich mit dir dort flanieren zu lassen, danke dafür. What a fascinating lady! Thanks for sharing, Val. I hope you got my message about the package. I am so relieved. The fact you recycled a blouse you will never wear, made me smile. I'm all about recycling and reusing. You certainly put it to good use. I always love things like that. I really, really like your British inspired journal page. Your London roots are certainly showing here. I confess, I wasn't all that impressed with the paintings today. There were a few I liked, but the group of people didn't impress me at all. I DID like the buildings, though. I guess we all have our likes and dislikes when it comes to art. I like YOURS though. The London reds are gorgeous. I loved the story about Mother Ey - what a wonderful person, and it's so great how the artists responded to her support. I Loved the 'needlework' really clever! The story and paintings of 'Mother Ey' etc were priceless, loved it. I will look for one! Love your red journal page and album.. Those Madame Ey painting are so amazing I love them all so much...wow terrific exhibit!! Thanks so much for sharing! You make me laugh that you recycled your blouse! heehee good job! Your hybrid is great,love those pops of red and the black&white background. Your album is so creative and unique -Bravo. Love your pictures too - "Mother" Ey looks like a jolly lady and I am sure she was adored by many. Thanks for sharing this story with us! Love you journal page - I am now ready to go to England! Oh what a sweet idea for your journal and what unique art. There's such a cleverness to your designs. I love your blog, every single post is amazing. My favourite part of this one is the 50 shades of red page – it’s just gorgeous. I love your journal cover and I love your red piece! You are brilliant! Those paintings in the exhibit are amazing! Big Hugs!